When I first started heading into Nottingham drinking it was Edwards, then it re-launched as the hideous Flares before a brief change to revival and prior to that it was the Tavern in the Town. 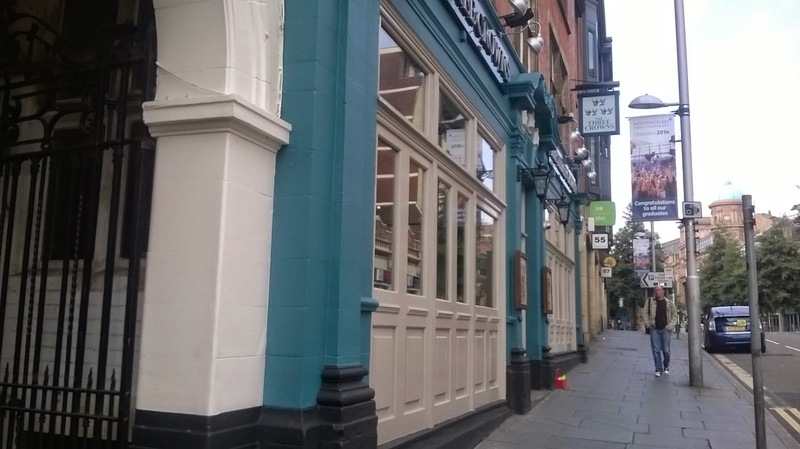 The site at 51 Upper Parliament Street was originally The Three Crowns and now, having been taken over by Sizzling Pubs- it’s been revamped with a nod towards it’s original status as a good old fashion city centre pub. With the 'Other Half' working in retail in the City we'll often head out for food or a few drinks after she's finished on a Saturday or Sunday so a new pub in Nottingham claiming to be bringing back the spirit of a traditional city centre pub for all it seemed a good opportunity to see what the Three Crowns has to offer. Having been deeply put off when walking into Flares and later Revival which had a lurid, dark artificial feel in the past it was refreshing to walk into somewhere light and airy just as the old Edwards had felt. The place felt welcoming. There was a buzz about the place with shoppers relaxing after a busy day at the sales, and city centre workers grabbing a relaxing pint on the way home from work. We love a nice real ale and therefore it was nice to see a selection at the bar from a few breweries I don't believe we've tried before. The friendly staff gave us a small taste of the interesting sounding Sambrook's Brewery Lavender Hill which definitely had a hint of lavender to it's flavours although as someone who likes my ale on the darker side I plumped for a pint of the Woodeforde's Norfolk Hawker and the missus went for a Hogs Back Brewery England's Glory which I'd think the company named in some over-enthusiastic optimism for the Brazil World Cup. The Norfolk Hawker was a lovely pint. It was a nice ruby ale with elements of spice. Definitely a good ale to have with a steak or burger. Whereas the England's Glory had a slightly citrus taste with overriding malty elements making it a far better drink than the World Cup performance. The next question was- "What shall we have to eat?" Time for Food- with added sizzle! For starters we plumped initially for the Chicken Wings and the Goujons, although sadly on ordering I was told that the Chicken Wings had sold out. It was a little disappointing for an early Saturday evening but I simply went for the Breaded Mushrooms with BBQ sauce instead. The starters seem reasonably priced and there's a small but varied selection on the menu. About 15 minutes later our starters arrived, piping hot. The chicken Goujons were more like mini-breast fillets and we received a good portion of 9 breaded mushrooms. The chicken was especially moist and came with an awesome Peri Peri sauce that was so good we put it to one side for with our main meal too. My only gripes with the starters related to their presentation- as shown below the order simply came on a giant lettuce leaf which did nothing for their presentation and they were bought out on dinner plates which made the excellent sized portions look significantly smaller than they should do so on the plates. There's a pretty extensive list of main meals to choose from, the majority of which are of a traditional nature but the Ultimate range will help satisfy someone with a big appetite like myself. Prices are pretty reasonable for the mains with prices starting from around the £6 mark putting the Three Crowns into the territory of being a viable alternative to Wetherspoons for good value food. I decided to go for the No.1 best seller on the menu. The Triple Decker Deluxe Burger, featuring a nice big beefburger, a succulent chicken breast, Monterrey Jack cheese and topped with a big portion of pulled pork. (Pictured below). On the side of that it came with a nice sized portion of piping hot chips which were beautifully crispy with a fluffy inner. It was a great burger and at £8.49 I'd consider well priced for what you get- especially considering the special offer on the menu is that on a Saturday if you have an Ultimate main course you can have your starter or dessert for free! The missus decided that as we were in a Sizzling Pub it only felt right for go for a main with a little sizzle. Her choice was the regular mixed grill although they also offer a mixed grill on the Ultimate menu too. Her food came out looking fantastic with all her meat (Steak cooked as she'd asked for, chicken breast, gammon and sausages) nestled on a bed of onions with her chips kept separate. We both have to admit that with the size of the main meals we were definitely feeling pretty full when out desserts came out. We went for the classic option of a cheesecake and an ice cream sundae was required on a hot and humid afternoon. The cheesecake arrived with fantastic presentation with drizzled toffee sauce and honeycombe crumb. It took no eating whatsoever thanks to a mildly sweet biscuit base and a beautiful dense topping. I went for the Brownie Popcorn Sundae which I'm sure should be labelled for sharing. It was huge! Featuring broken brownie pieces in soft ice cream and topped with lashings of thick cream with toffee popcorn. This is the kind of dessert that will really appeal to children and big kids too. 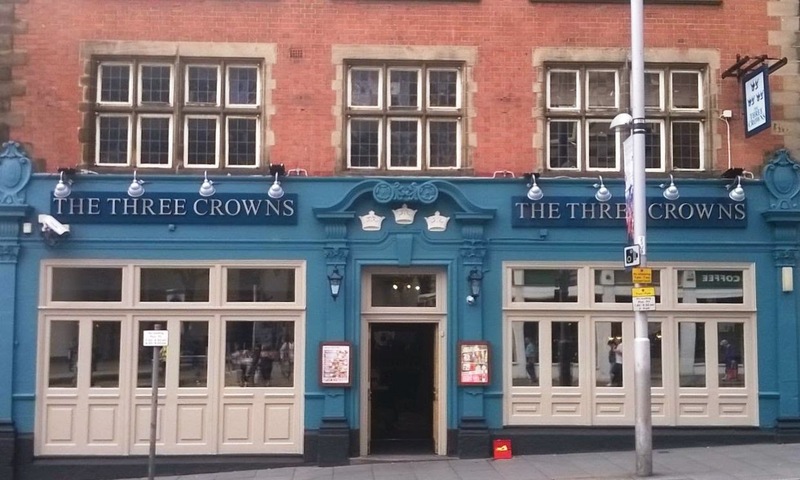 Our overall impression of the Three Crowns was very positive. It seems like a great drinkers pub where we would happily go to for a drink early in a night out, although it's equally at home as somewhere we'd head to for a reasonably priced meal too. There's a good choice of beers to choose from with clear display on the bar and the friendliness of the staff give it a local pub feel. What Beer Do They Drink In Sardinia?